The first step to winning a debate is to define the terms used to discuss the issue. 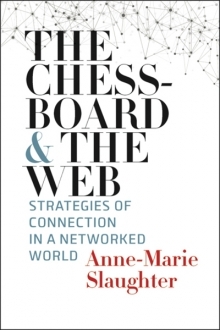 In The Chessboard and the Web, Anne-Marie Slaughter, the former director of policy planning for the U.S. Department of State, characterizes international relations as a series of interconnecting relationships. Rather than pursue a statist realpolitik strategy, she argues in favor of a cooperative, supportive approach. Dr. Slaughter starts her argument by comparing the traditional view of competition described by Thomas Schelling’s classic text on game theory, The Strategy of Conflict, with operations on a chess board. Of the classic two-by-two matrix games that Schelling describes in his book, the game of Chicken comes closest to emulating the risk of nuclear war that lurks in the background of many international conflicts. If you’re not familiar with the game of Chicken, you might have seen it in 1950s teen movies, when two boys drive at each other at high speed. The first one to swerve is the “chicken” and takes a small loss, but if neither swerves there’s a head-on collision and both players suffer a huge loss. The Prisoner’s Dilemma, perhaps the best known of the classic games, demonstrates how a game’s payouts can be constructed to convince individuals to violate their best interests. The idea is that two criminals have been apprehended, separated, and offered a choice. If a criminal testifies against the other (defects) and the other refuses to testify against them (cooperates), the one who testified will go free and the other will go to prison for ten years. If both testify, they will go to jail for five years. If neither testifies, each will go to jail for one year. Even though the best choice for both criminals is to refuse to testify and serve a little time in jail, the fact they can’t communicate with each other means they can’t trust the other’s intentions. The penalty for unmatched cooperation is a long jail term while the other goes free, so the logical choice is for both to defect and accept a suboptimal outcome. The third game Slaughter mentions, the Stag Hunt (also called the coordination game) allows for scenarios where two players can achieve better outcomes by cooperating than by competing. In the Stag Hunt, two hunters can choose to go after a hare or a stag. If a player goes after a hare, they will always get it and win one point. If both players go after a stag, they will each get three points. If one player chooses hare and the other chooses stag, the player choosing hare gets one point and the player choosing stag gets zero. Even with repeated play, it’s easy for players to fall into the trap of getting a steady payoff of one point per round without discovering that cooperation yields better results. As with all of the classic two-by-two games, the main limitation is the lack of communication between the players. After introducing game theory, Slaughter describes networks and basics of network analysis in the context of international relations. For example, she mentions different measures of connectedness, such as the number of connections leading to and from a network node (its degree), the node’s place in the network (its centrality), and the number of times it serves as a connection between two other nodes (its betweenness). She then explores the strengths and weaknesses of the standard network topologies: star, hub-and-spoke, and mesh. Networks appear throughout international relations, whether among states (such as the European Union) or in non-governmental organizations and terrorist groups. Some networks are tightly interconnected (have a high density), while others are more sparse. Slaughter describes several major types of international networks, starting with resilience networks. Resilience networks can serve as defense, recovery, and stabilization tools. Doctors Without Borders is one example of a networked organization that provides health care in recovery and stabilization roles. Task networks are similar to resilience networks in some respects, but one distinction is that they are temporary groupings assembled to complete work through cooperation, collaboration, or innovation. Cooperation comes with significant risks. If a partner defects, such as when an OPEC member nation produces more oil than its quota allows, then the strength of the network depends in large part on the effectiveness of punishments administered by other group members. The final category of networks, scale networks, describe how solutions that work well in microcosm can grow. In a replication network, a solution can be repeated with little or no modification at a new location. One such network is the Global Alliance for Vaccination and Immunization (GAVI). GAVI coordinates transport and delivery of vaccines to vulnerable populations to help restrict the spread of disease. Finally, cumulation networks bring knowledge and expertise into a single entity. One example is GitHub, the online source code repository that programmers around the world rely on. As you might expect, Slaughter argues strongly in favor of a networked approach instead of following the realist’s emphasis on states with interests rather than allies. She cites former Secretary of State Hillary Clinton’s adoption of Joseph Nye and Suzanne Nossel’s concept of “Smart Power”, where states use all means at their disposal, from military power to trade, diplomacy, and foreign aid, to influence allies, institutions, and international norms. At some point the distinction between “smart power” and the traditional realist view becomes moot; realists use all of those tools as well, they just do so with different intentions. Foreign policy, diplomacy, and statecraft require careful planning and execution to advance one’s interests. As with all such debates, it’s a matter of striking a balance between a state’s interests and those of its allies, competitors, and neutrals. Advocates of the Hard Gatekeeping approach would argue that the “Smart Power” approach isn’t so smart because it would leave the U.S. exposed to defectors. Even so, I find Slaughter’s arguments in The Chessboard and the Web to be convincing if not quite compelling. States can benefit from well-applied connections, but deciding on the extent of that connectivity and exposure is a devilishly tricky prospect. Highly recommended. Curtis Frye is the editor of Technology and Society Book Reviews. He is the author of more than 30 books, including Improspectives, his look at applying the principles of improv comedy to business and life. His list includes more than 20 books for Microsoft Press and O’Reilly Media; he has also created more than 50 online training courses for lynda.com. In addition to his writing, Curt is a keynote speaker and entertainer. You can find more information about him at http://www.curtisfrye.com and follow him as @curtisfrye on Twitter.